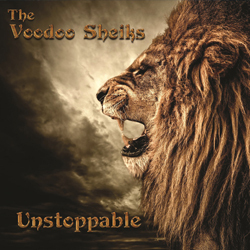 Our New Album: ‘Unstoppable’ will be released on May 4th. 12 original songs penned by us and recorded with Damon Sawyer at the controls once again. Big thanks to Stuart Dixon for stepping in on production duties for a couple of days too. We have a very special guest on keyboards too! Paul Long has laid down some groovy keys on four tracks and we are extremely pleased with the results and I’m sure you will be too. The album launch will be a hot ticket affair at The Surrey Blues Club, Hersham. OK it’s free entry! There’ll be plenty of the new songs in set, naturally! As you read this the CDs are getting the full duplication process from Sean Lynch at Torch Music, Ascot. Artwork design and layout is by our very own Slowblow Dave. The album will be available from our website, at any gig and as a digital download from all the usual online shops. Exciting times lay ahead for The Voodoo Sheiks so keep an eye on our website along with Facebook, Instagram etc. Here’s to a crackin’ 2018, Keep It Live!